There are lots of things I love about Halloween, and one of my favourites is the myriad of macabre movies at your fingertips. Whether it’s taking a trip to the cinema to view a new offering, or settling in to watch a classic, what better way to get into the spooky spirit than to scare yourself silly? If you’re not sure where to start, or you’re looking for a new recommendation, here are a few of my favourites. A childhood favourite full of camp comedy and incredible costumes that follows the grim goings-on of three Salem-trial witches resurrected in modern day (’90s) October. It always brings back a great feeling of nostalgia for me, but first time viewers will crack just as many laughs — and if not, there’s always Bette Midler’s I Put A Spell On You number in the film’s finale. As if Roald Dahl’s book wasn’t horrifying enough as a child, they subjected us to a film medium as well. It tells the story of a cult of witches, let by the brilliantly bleak Angelica Huston, who rely on the bodies of children for sustenance. This gave me nightmares for weeks as a kid; now, not so much, although one of my uni flatmates still can’t watch it to this day for fear of flashbacks. My favourite and, in my personal opinion, the most aesthetically beautiful of Guillermo del Toro’s works. The film shows the young Ofelia exploring the overgrown labyrinth in the garden of her new home, five years after the Civil War. There she meets the mysterious and slightly creepy faun, who sends her on a number of errands. The perfect scary film for people who don’t like scary films. I’ve watched this film too many times to count, and I still can’t fathom it out. Donnie is plagued by Doomsday visions and visits from a man in a disturbing homemade bunny suit in the days leading up to Halloween. It was a low budget film, so it’s not the most visually amazing film ever, but it’s since gathered a cult following and is certainly thought-provoking and at the very least, an interesting watch. This is a weird one, and even thinking about it now makes my skin crawl. The films tells the story of a strained single mother and her morose little boy as they find an unexplained children’s book called The Babadook, which wreaks truly chilling havoc on their lives. It is not all-singing, all-dancing, in-your-face style terror, but rather a psychological prickling that creeps up on you and plays on the childhood fear of the monster who lurks in the shadowy corners of your bedroom. Also, heads-up: the dog dies. A brilliant supernatural post-war thriller, interwoven with elements of The Gothic (which is what makes it so special for me — I bloody love The Gothic). Nicole Kidman plays a mother whose life with her two children is structured by a strict set of rules to keep their uncommon photosensitivity condition under control. They are joined by three new servants and then strange things start to happen in their remote country home. Really dark and eerie with a few chilling moments and a great twist — don’t spoil it for yourself by looking it up! Another twist involving a creepy little girl. A strained married couple adopt nine-year-old Esther to soothe the loss of their unborn third child, but she is not all she appears to be. Gory, blunt, and a little shocking in places, the build up to the twist is better than the conclusion, but it makes gloriously uncomfortable viewing, and Isabelle Fuhrman, who was only 12 years old at the time of filming, displays spectacular talent. The first film adaptation of Stephen King’s iconic bibliography, and so, so much better than the 2013 remake. The heartbreakingly naive and inoffensive Carrie White (played by the wonderful Sissy Spacek) is bullied relentlessly at school and at home, and enacts a fiery, telekinetic vengeance. You shouldn’t feel glad that these people are subjected to so much harm, but they’re awful enough that you’re cheering Carrie on from the sidewalk as she wreaks her incredible havoc. The Insidious film series focuses on the case files of demonologist Elise Reiner, who helps families locate and get rid of the supernatural horrors attempting to enter their lives (and bodies — yes, it’s an exorcist one). The plots are ambitiously intricate, which doesn’t always work in their favour (if you’re gonna skip one of them, make it Chapter 2), but in my opinion, the first and third instalments are two of the scariest modern horror films that don’t rely on pure shock. I watched Chapter 3 in the cinema with my mum and we were clinging onto each other and squealing the whole way through. I couldn’t list my favourite Halloween movies and leave out The Shining — it’s just iconic, isn’t it? For those of you who aren’t familiar with this cult classic, Jack Torrence (Nicholson) slowly succumbs to murderous madness as he safeguards a huge, remote hotel during the winter months with little to occupy his mind and only his wife and son for company. For me it’s not obviously scary, but there is something unnervingly compelling about Nicholson’s portrayal of Torrence’s mental break. Also, recognise that carpet? 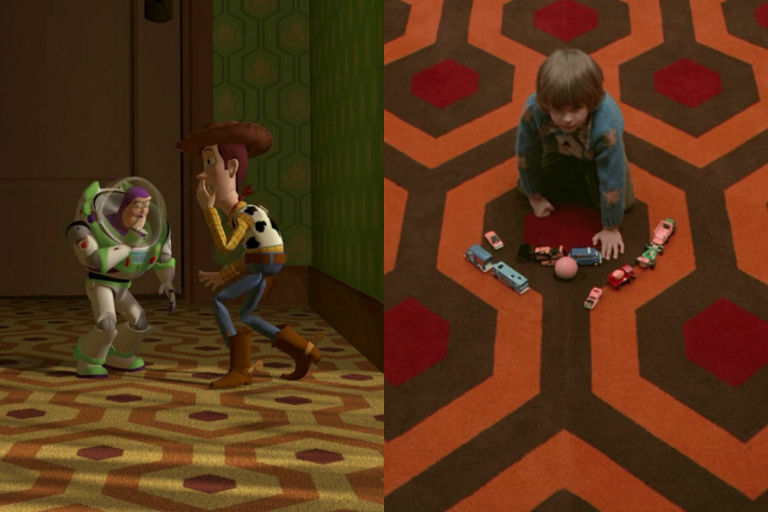 You should — Toy Story mimicked the design! Ooh there are some really interesting picks here and some I havent watched. Guess I’ll have to fix that! Why did you have to put a picture of The Witches on here!? It makes me feel sick thinking about it. The hotel where they filmed it is in Newquay! Why does it have to be a real place! ?